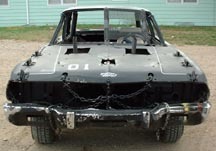 This is the car I drove in the 2002 Chouteau County Fair in Fort Benton. I broke my driveshaft in both heats. The car is still in very good shape. 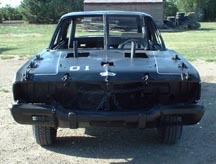 This car will be back next year. 2. Front and back-ends are very tough. 3. Weighs more than most cars. 4. Leaf springs and torsion bar suspensions. 2. Rear goes up fast once it starts to bend.